b. Find the area of a rectangle with fractional side lengths by tiling it with unit squares of the appropriate unit fraction side lengths, and show that the area is the same as would be found by multiplying the side lengths. Multiply fractional side lengths to find areas of rectangles, and represent fraction products as rectangular areas. How did the teachers reflect on student learning? What did Ms. Farmer learn from watching Ms. Gray's lesson? How did the teachers sort and learn from student work? I really enjoyed listening to the reflecting on teaching and learning. This is something I've never done at least the way t they're doing it watching someones else class and looking at what did not and what did work is really a big help I can't wait to bring up this great idea in the next school meeting. Jennie Beltramini: So we have been collaborating around this lesson for a while. We designed it together and tweaked it a lot. Alicia Farmer: Imagine if you could watch what you’re going to teach before you teach it. Jennie Beltramini: Let’s talk about the number talk a little bit. You had done a number talk in your lesson, as well, but you were doing whole number multiplication and we made the decision to switch to a fraction. Jennie Beltramini: There’s an initiative that’s intended to help teachers get better at teaching fractions. And within the standards that we are teaching, one of the main focuses of third through fifth grade is fractions. So this project is intended to help support teachers teaching within fractions. Kristin Gray: You had a student, which I loved, the one-fourth of 16 is four. They said I know that half of a half is a fourth and you wrote half of a half equals one-fourth. And I think that was a beautiful lead in to the cornbread task where they’re taking one-third of one-fourth. Jennie Beltramini: The lesson I taught was about introduction to multiplying fractions. So it’s really the first time that students are taking a part of a part of anything. In fourth grade, they look at repeated edition with whole numbers and fractions, but in fifth grade they start doing fractions multiplied by fractions for the first time. Jennie Beltramini: So we had a collaboration session today and that involved myself and Alicia and then Kristin, who’s a teacher from Delaware, who came out to collaborate with us around this lesson and actually, we had collaborated around the lesson beforehand remotely. Kristin Gray: When you look at the one-fourth of one-third equals one-twelfth, it’s interesting what’s happening with that numerator and denominator and why that’s happening in your picture. Alicia Farmer: The thing that we got to do is Kristin taught the same lesson a week ago. We use Teaching Channel teams to upload Kristin’s videos, so all of us watched it, made comments, seeing what her kids were doing was so valuable. I was able to say okay, I know where my kids are going to come into this and I know what I need to do to address misconceptions. Alicia Farmer: I mean we fixed so many things from when she taught it a week ago to when I taught it and it went beautifully in my class. Alicia Farmer: Oh, that’s clear here. 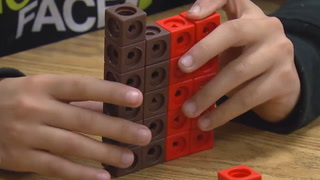 Student: -- and there’s 12 pieces, there would be one in each one. So we got one. So we did 12 divided by 12 equals one. Alicia Farmer: Okay. So each one is worth $1? Alicia Farmer: So this is kind of like that bar method we were doing yesterday, isn’t it? Student: That’s what we were kind of talking about. Kristin Gray: We opened the collaboration. We’re talking about the math in the lesson, what we saw in my classroom and then what we had observed in Alicia’s classroom as far as the mathematics and the number talk and the two problems that we posed. Kristin Gray: You launched the lesson. I like how you launched it because our mathematical goal was this multiplication and so you had them in that mindset of thinking about multiplication as they were working. And then I wondered if we should open it up with which operations just because that division always comes up because they’re dividing it up. Kristin Gray: And I think that maybe we could think about opening it up as which operation. Kristin Gray: Because division is-- I mean it’s just invert so you’re dividing it into four parts, you’re multiplying it by a fourth. Alicia Farmer: There were some similarities and some patterns between the work from Kristin’s class and then from mine. Alicia Farmer: Even with the changes that we had made, we could see the kids that were understanding that this was a multiplication, there was some reasoning that was the same even on opposite sides of the country. Kristin Gray: This one was like one of the ones your student had said, and this is what we were looking for in this question is that it’s becoming twelfths in that second problem because you have six on this half. And so to get equal sized pieces, you’re doubling that amount. Kristin Gray: And that’s what we were hoping the kids would get to. Jennie Beltramini: So maybe we could set this one out aside because I feel like this might be a good anchor piece for us when we’re sorting Alicia’s to see to what level of understanding did students get. This is a-- we know this is sort of a high level of understanding. This is one of the tasks I think of collaborative groups a lot is thinking how we’re going to sort student work into different levels so that we can really see where is each student understanding and performing and then we can look at groups and see what would be next moves with these groups in terms of instruction. Kristin Gray: I think I always knew the tasks were there and I understood the mathematics behind it, but really those conversations take it to a whole other level. 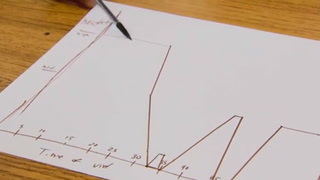 It’s a much deeper understanding and thinking about student work and looking at student thinking and this trajectory. So I think I’ve become a better teacher just through this reflection process. Alicia Farmer: This is Luca. So he tried to do the area model on this. So he did a fifth times a half is one-tenth and a fifth times a half is one-tenth. So he was actually doing the area model here that they have learned with whole numbers, except he’s not setting up-- well, I guess this is a half and a half. Alicia Farmer: He does. Okay. Jennie Beltramini: And does say “Gone” here. Alicia Farmer: And then I see it in the one-fifth times one-half equals one-tenth. And then this is where he is explaining why that works. Jennie Beltramini: I think that this language is language that we might want to push him. Card: B) Where do you see multiplication in this problem? Explain your reasoning, I see it in 1/5 x ½ = 1/10 in each box. Jennie Beltramini: Yeah, because he likes numerical. Jennie Beltramini: He likes that, you know? Kristin Gray: But he’s right there with that area model. I mean if you asked you him to just put where that three-fifths-- I mean if he just combined those fifths, that’s exactly what he would want to see for a student saying three-fifths. Alicia Farmer: Oh, well, I guess that’s the three-tenths. I was like oh, I think it’s right there but you’re right. Alicia Farmer: It was really interesting going through it with Kristin and Jennie. Usually I’m doing that by myself. But to have two other people have their input on what my kids-- they’re looking at it and they’re saying well, I think that this is a high because and then I’m like oh, yeah, I even missed that part. So just having two other people to help me see where my kids are, that was really exciting. Jennie Beltramini: I would probably model a student that used the language three-fifths of a half. Jennie Beltramini: And then maybe use one like this to sort of have that conversation. Alicia Farmer: Then they helped me plan my next steps and we used what Kristin was doing in her class because she had taught this a week before. So she’s now a week ahead of me. I’m going to probably follow the same trajectory because I think our kids were kind of in the same place. Jennie Beltramini: -- others need like the actual. Kristin Gray: Especially if they have the picture. This one could be well, where did you get tenths? Why did you get tenths? Kristin Gray: Well, this was nice to actually see a lesson refined and then retaught. So I felt like I had an ownership in making the lesson I taught better and working with people who truly have a deep understanding of the mathematics and passion that I do. Kristin Gray: So it was nice watching it and feeling like it was we. I kept saying well, we. Kristin Gray: Because I got to see the-- we never-- you coach and you work with somebody but you never get to see it fixed because you give that lesson and you move. Kristin Gray: So it was neat to do it and then see what happens in Alicia’s class. Jennie Beltramini: Yeah, that was great. Alicia Farmer: Well, thank you. I appreciate it. I will take this next steps, go back to my classroom and start planning.